Home / TallyERP.9 Lessons / How to Pass Entry on Profit of Sale of Fixed Assets in TallyERP.9? How to Pass Entry on Profit of Sale of Fixed Assets in TallyERP.9? Today we learn about calculation of Profit / Loss on Sale of Fixed Assets. We have some request in our Tally Knowledge whats app group about "How to Pass Entry on Profit of Sale of Fixed Assets in Tally". To calculate the gain or loss on the sale of an asset, you compare the amount of cash received for the asset to the assets's book (carrying) value at the time of the sale. If the cash received is greater than the asset's book value, the difference is recorded as a gain. If the cash received is less than the asset's book value, the difference is recorded as a loss. In order to have the book value at the time of the sale, you must record the depreciation expenses upto the date of the sale of asset. Vijay Purchase Car on 15/4/2013 for Rs. 5,00,000/- and Sold the same car on 26/08/2018 for Rs. 400000/-. In this case, we calculate depreciation on car till last year in which car is sold e.g. 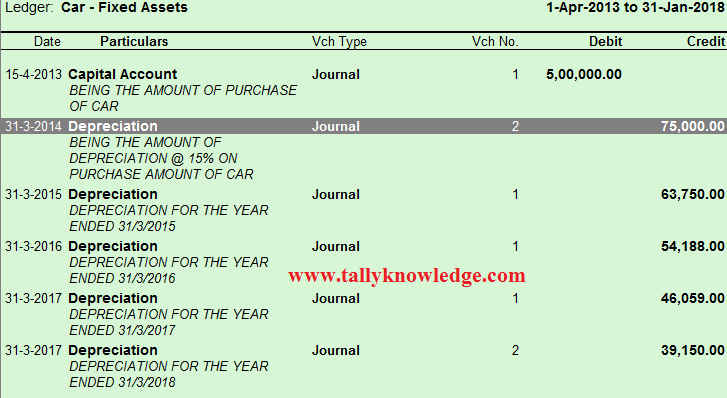 is car sold in FY 2018-19 then we calculate Depreciation till FY 2017-18 or calculate till date. 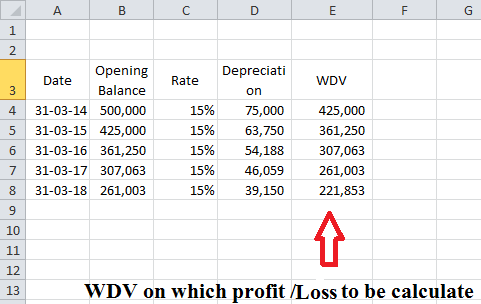 If total sale amount is more then WDV then it is profit or if Total sale amount is less then WDV then it is loss. In this illustration, Total Cost of Car is Rs. 500000 less depreciation Rs. 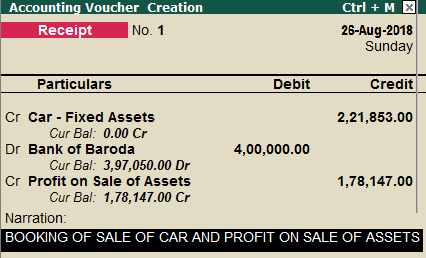 278147/- Net value of asset is Rs. 221853. Now car is sold for Rs. 400000/- Less WDV 221853/- = Rs. 178147 is gain.